A container that waters itself? Almost. The self-watering container (SWC) has a water reservoir that you must keep filled, but other than that, the container and the media work together to provide water continuously over a long period of time. SWCs can be used to grow a wide variety of vegetables, herbs, perennials, annuals, and small fruits such as strawberries, blackberries or blueberries. They open the door to gardening in places once thought impossible. They can be used on rooftops, patios, balconies, porches, carports, driveways, pool decks, door yards, sunny office windows, city sidewalks, and classrooms. They enable you to garden where there is no garden. Those with plenty of garden space will also find a place for SWCs. They are a quick and easy way to expand garden space during peak seasons. They can be tucked into areas not currently utilized as garden space, such as along a garage wall or fence line. They can also be used for special applications, such as starting transplants from seed, rooting cuttings, or holding plants temporarily until a permanent location can be decided. SWC's are a type of Sub-Irrigated Planter (SIP). They are called sub-irrigated because the water supply comes from the bottom of the media. SWCs and SIPs are popping up everywhere. They are becoming more popular in commercial growing applications, usually where there are tight water restrictions or where soil has been severely damaged from conventional farming methods and extended use of agricultural chemicals. What are the advantages of using an SWC? Water savings - The average SWC represents a water savings of 60% over in-ground gardening. If you are under water restrictions, you can still have a bountiful garden; no sprinklers required. Some plants require a constant and consistent supply of moisture to reach peak texture and flavor. It can be tricky to insure this in the garden. Summer heat may mean that the garden has to be watered daily, even bi-daily. Busy people struggle with this. An SWC is uniquely suited to solve this problem. Water is available on demand - the plant's demand. No more bitter lettuce, no more blossom end rot in tomatoes, no more woody root crops. Plant health - The soil environment of an SWC is completely in your control. If something you would like to grow has a special soil requirement, such as pH, you can provide that environment in an SWC easily and economically. Soil borne pests and diseases are rare, virtually eliminating the need to use chemical controls. Moisture swings that affect the health and quality of many vegetables are virtually eliminated in SWCs. Economy - SWCs can be built from recycled components, including containers that might end up in a landfill. Nutrients are never lost to leaching - they stay in the container so none of your dollars wash down the drain into the watershed. Accessibility - Since most SWCs are above knee height, they can be tended while sitting on a stool or even from a wheelchair. If you thought you had to give up gardening after knee or back surgery, welcome back! The harvest can be a delight; sitting on a stool or “garden scooter” with a pair of scissors in your hand and a basket at your feet, snipping salad greens, plucking tomatoes, pinching herbs, and cutting a few flowers for the table. Labor savings - SWCs do not require tilling, heavy digging, or frequent weeding, so they are friendly to seniors who miss their gardens, or to school children for their first gardening experience. Optimize micro-climates - SWCs can be portable, depending on size. You can locate them in sunny areas in the winter, and move them into increasingly shadier areas in the summer to extend your seasons to grow leafy greens and other cool season crops. Commercially produced SWCs are available. They can be pricey, and they aren’t always the right size and shape. Many users are concerned that the soil chamber is too shallow for many plants. Building them yourself allows you to design a set of containers that suit your own spaces and needs. The dollars you save making them yourself can be spent on top quality media, organic nutrients, and more plants and seeds! Don't worry - it's easy and requires materials that are widely available and a few common household tools. The SWC we describe below can be built for less than $10 using all new materials, and even less if recycled components are used. Before we get started, let me say that there are many different methods that can be explored. The following pattern is just one way. We developed this method after seeing over a dozen different DIY SWC patterns, plans, and videos. Our goal was to create something simple and inexpensive. Once you learn the basic principles of how they work, we encourage you to explore other containers and design options that work well for you and with the materials that are readily available in your own neck of the woods. 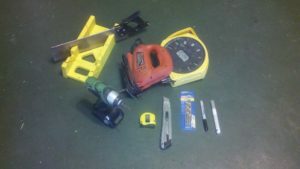 All of these will be constructed from common items using a few basic tools. We are going to use an 18-gallon storage tote for this example. They are readily available, inexpensive, and are a great size for many plant choices. The Aeration Shelf supports the Soil Chamber and sits above the Water Reservoir, creating an air space between the media (root zone) and the water. This air space provides oxygen to the root zone and prevents the media from becoming over-saturated (waterlogged). The Mulch Cover Retainer keeps a plastic or fiber mulch in place after planting, and provides additional strength to the top rim of the container. Both are made from the lid of the tote. Snap the lid on the tote. Note that the lid has a lower flat surface we call the “pan” and a raised lip that we call the “rim”. Both are used in our project. Preparing the Aeration Shelf and Mulch Cover Retainer are much easier, and safer, when the lid is in place. It provides some support and keeps hands and fingers out of the way. Place the 1-gal pot in the center of the lid, upside down. 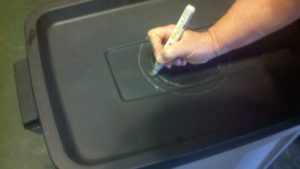 Use the Sharpie to trace the top perimeter of the pot onto the lid. Turn the pot right side up and center it inside your previously traced circle. Use the Sharpie to trace the bottom perimeter of the pot. Draw a dashed line between the two traced circles, creating a dashed circle. Decide where you want to locate the Fill Tube (see below). 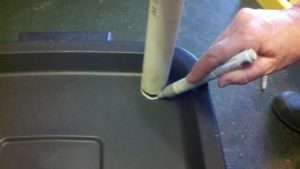 Place the 1.1/2” PVC pipe in that location and trace the outside of the pipe with the Sharpie marker. It should be just slightly larger than the PVC so the pipe slides easily and does not bind up. If you locate it in a corner, as shown here, it will be well out of the way of your plants, and easy to get to when you are filling the reservoir. After you have made your first SWC, you may find that another location is more convenient for you. 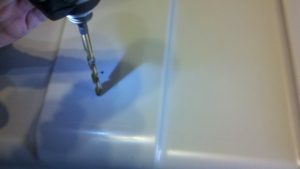 Using the drill and ¼” bit, drill a grid of holes about 1” apart each way in the flat surface of the lid. Stay at least 1” away from the center hole and from the start of the rim of the lid. 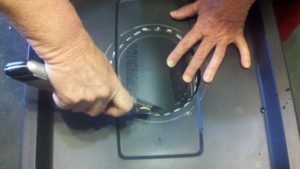 With the lid still in place, cut out the dashed circle using the utility knife or jig saw. If you are using the jig saw, you must drill a starter hole first. Cut out the hole for the Fill Tube. Cut the “pan” of the lid out, leaving the rim intact. 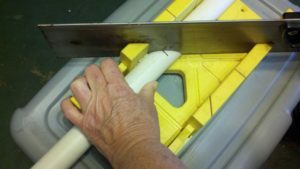 You can cut this carefully with a sharp utility knife, or use a jig saw. The location of this cut is different for each tote. 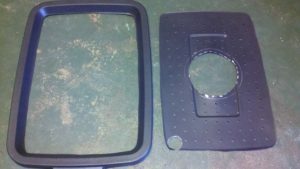 It will be at the point where the "pan" of the lid joins the rim. You can find this point by setting the tote on the lid. 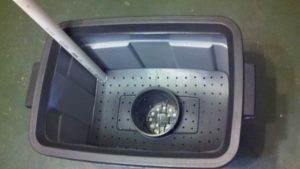 They are all designed for stacking, with the bottom of the tote sitting on the "pan" and the rim of the lid rising from the outside of the tote bottom. This is an important cut - the Aeration Shelf must fit into the lower portion of the SWC without a lot of space between the shelf and the inside wall. 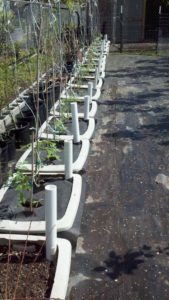 The now prepared “pan” of the tote lid has become your Aeration Shelf and the rim has become your Mulch Cover Retainer. Set them aside. This will be made using the main body of the tote. The bottom of the tote will be the Water Reservoir, the top portion of the tote will be the Soil Chamber, and the two will separated by the air space created by setting the Aeration Shelf on top of several supports, then drilling a drainage hole 1" below the final height of the Aeration Shelf. For our project, we are using recycled nursery pots as our supports. There are lots of other options – short lengths of PVC, Solo cups with holes punched in them, tin cans with both ends cut out (make sure they are not coated with BPA), reclaimed 1# plastic coffee cans. You will need enough of whatever you use to support the Aeration Shelf and the moist media in the Soil Chamber. It is a good idea to plan to nearly cover the bottom of the reservoir with the exception of the holes we cut for the Wicking Pot and the Fill Tube. Set one of the supports (pots) beside the body of the tote near where you want to locate the drain hole. This can be any place on the sides or ends of the totes. 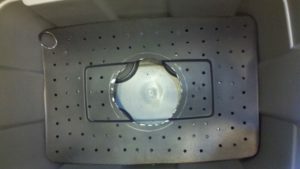 The consideration is that you should be able to view the drain hole while you are filling the reservoir, and you should have the SWC drain in a convenient direction (for you). 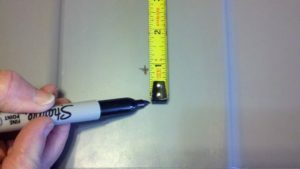 Mark the spot with a dot using the Sharpie marker. This spot should be the level where the "top" of the support meets the side of the container. You may have to tilt the marker slightly to compensate for the diameter of the marker. Measure and mark a dot 1” below this spot. Drill a ¼” hole at the lower dot. 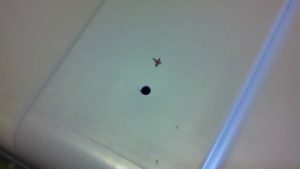 Since most surfaces are not level, it is best to drill more than one drain hole. I usually drill one on each of the opposite sides of the tote. Whichever one is lowest will drain from regular refills, and the other one will help handle any excess rainfall that threatens to drown the tote temporarily. The Wicking Pot is the magic that makes everything work, so we will take time to make sure that we build it correctly. 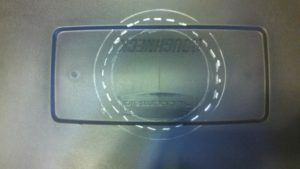 There is more than one way to construct the Wicking Pot, but the principles that make it work must be met. 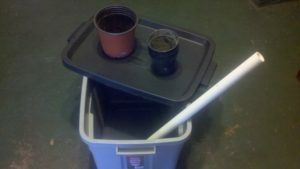 The Wicking Pot must sit on the bottom of the Water Reservoir and reach through the Aeration Shelf into the Soil Chamber. It must have sufficient holes in the base to draw water into the Wicking Media. It must have holes in the sides that will be in the air gap. 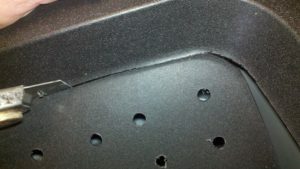 These holes allow for the air in the media to be displaced during the capillary action that makes the Wicking Pot work. A 5” Pond Basket meets all of these criteria. A Pond Basket, or Net Pot, is a square, perforated pot made to hold aquatic plants. They are available at many nurseries and big box stores that carry pond supplies. 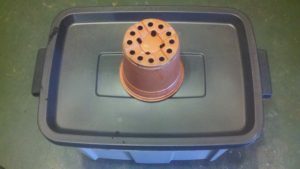 However, a very effective Wicking Pot can be made by recycling a plastic 1-gal nursery container. 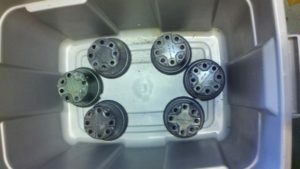 These pots usually have a bottom hole and often 3 – 4 additional drainage holes, but these are not sufficient for our purposes. Drill multiple ¼” diameter holes, 1” apart in all directions for the entire height of the pot and all around its circumference. Note: The 1-gal container we used in this SWC had more bottom drainage than the average nursery pot. It may have been from a succulent nursery. 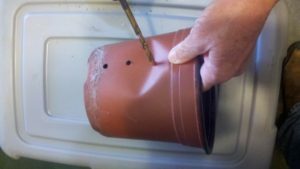 If the walls of the pot are thin, as you see here, go slowly or use a hot nail or the tip of a soldering iron to make all of the holes. There are 8 rows of holes when we finish. Water must be in the Reservoir at all times. It does not have to be full, but it cannot be allowed to dry out completely at any time. The easiest way to keep the Reservoir filled is with a tube that sits in the reservoir and is filled from the top. This provides constant bottom-up watering and does not wash the nutrients from the media into the reservoir. The Fill Tube should extend well above the top of the SWC so soil does not fall into the tube. The actual height can be anything that is convenient for the user. 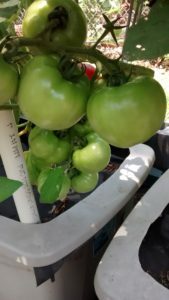 I like mine at about 2’ tall because they don’t get lost in the foliage, it is an easy height to fill with a water hose, and it means that I can get (5) Fill Tubes out of one 10’ length of PVC. If you are only planning to build one or two SWCs, most big box home improvement stores will sell pre-cut lengths. They are a little more expensive than buying it in bulk lengths, but this way you won't have scrap to deal with. 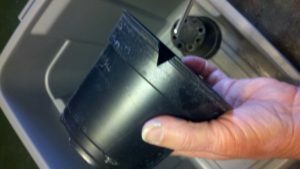 The Fill Tube should be located on one of the outside edges of the SWC, but it does not matter if it is on the sides or the ends. The location should be the most convenient for watering access. Cut the end that will sit in the reservoir at an angle so it will never become blocked (you can also drill several holes in the side of the bottom 2”). The Aeration Shelf must sit above the top surface of the water in the Reservoir, so it needs something to support it. You can use any number of things for this purpose - 15-oz tin cans, lengths of PVC, quart (6") nursery containers, even Solo cups. Strong enough to support the weight of the media. Approximately 4.1/2" - 5" tall (for an 18-gallon tote). Allow water to flow into and around them (must have a vent at the top). Numerous enough to keep the Aeration Shelf from sagging. 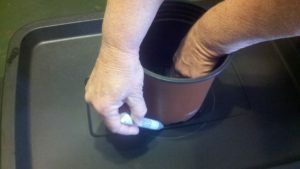 For this demonstration, we are using quart (6") nursery pots. We will modify them a bit. Cut a notch in the rim of the pot. 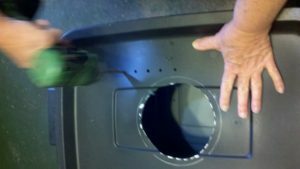 This allows water to flow into the can, preventing it from creating an "air lock" if the rim sits tightly to the bottom floor of the Reservoir. These pots work to allow water to flow in and around them because there have drainage holes that work as an air vent. 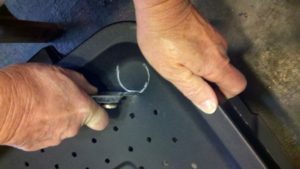 If you are using a support that will not vent air from the top, you must drill a vent hole. Now that we have prepared the parts, let’s put them together and start planting! Set the Water Reservoir/Soil Chamber in its permanent location (they are heavy once filled). Set all of the Aeration Shelf supports into the bottom. Set the Aeration Shelf on the supports. 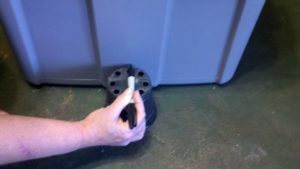 Slide the Wicking Pot into the center hole and check it for fit – it should sit into the hole easily and the bottom should rest on the floor of the Water Reservoir. 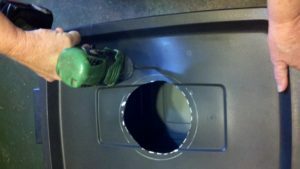 If it doesn’t sit on the floor, use the utility knife to loosen the hole a bit. 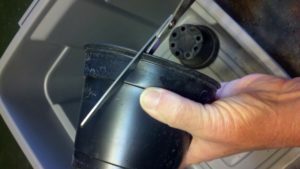 Remove the Wicking Pot after checking for fit. Slide the Fill Tube into its hole. Snap the Mulch Cover Retainer in place. I find it helpful to use a couple of small binder clips to hold it in place while I work, and later while the SWC is in use. The media for the Wicking Pot is important – the wrong composition will cause the wicking aspect to fail. This is only for the Wicking Pot. Do not use this as your planting media. Mix 1 part peat, coir, or peat-based potting mix, 1 part Perlite or Expanded Shale, and 1 part Vermiculite. 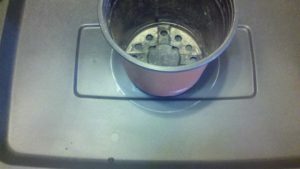 You will not need large amounts; just enough to fill the Wicking Pot. Moisten this mix thoroughly. You should be able to squeeze a few drops of water out of the mix. Fill and pack the Wicking Pot with this media. It should be packed tightly. Leave 1.1/2” of headspace at the top. Water the filled Wicking Pot until water drains from the bottom. Fill the headspace with Vermiculite. This should be filled to the point of spillage. 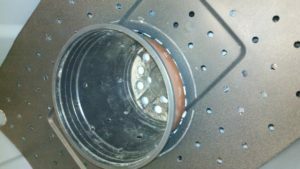 Set the Wicking Pot back into its space in the Aeration Shelf. If possible, mound a little bit of additional damp Vermiculite on the top of the pot, but don’t allow it to spill into the Water Reservoir. Scoop prepared planting media (see below) into the Soil Chamber until it is 1/3 full. Water thoroughly and lightly tamp it. We do not want to over-pack the media because it is our root environment, we just want to make sure that there are no air pockets in the soil. If you are going to use a dry or pelletized SROF such as Arbor Gate Organic Blend or Microlife, add ½ cup scattered evenly over the media after you wet this layer. Repeat with the second and last third, again watering thoroughly each time and adding ½ cup SROF. This step is to insure that there are no dry pockets in the media and that it is thoroughly dampened. All surplus water will drain into the Water Reservoir. Starting with thoroughly and evenly dampened media is one of the keys to making SWCs work. The amount of SROF we are using is a little more than recommended for this volume of soil, but it will be expected to last all season. Do not do this with synthetic fertilizers. Slow release organic fertilizers release over an extended period of time. Synthetics will cause problems. If you are going to liquid feed with something like fish emulsion or Ocean Harvest, you can fertilize in the Water Reservoir later. Once you have filled the Soil Chamber, mound additional media on the top. This mound increases the root area and creates a drainage mound that will shed surplus rainfall off of the top instead of through the media. Shedding surplus rainfall helps maximize the life of our nutrients. The Mulch Cover is used to suppress weeds, to reduce evaporation, and to shed excess rainfall. You can use a black plastic garbage bag or a section of weed mat trimmed to fit. I personally use weed mat. It is porous and allows me to use nutritional drenches if I wish. The Mulch Cover should extend past the rim of the SWC so it can be held in place with the Mulch Cover Retainer. Using the binder clips to hold this all in place is convenient. To plant through the Mulch Cover, cut X shaped slits in the plastic, pull the cover back, and set the transplant in place or plant your seeds. If you are broadcasting a seed crop or planting closer than 3” spacing, do not use a Mulch Cover. You can mulch with pine straw or compost just as you would an in-ground garden. Taking care of an SWC during the growing season is easy. Just keep the Water Reservoir filled. The media in the SWC will remain damp even in hot weather. The top few inches may feel dry if you are not using a mulch cover, but you will find perfectly damp soil when you insert your finger into the media. If you use a mulch cover, even the top will feel damp. If you have fertilized before planting, you will not have to side dress during a normal growing season. As always, keep an eye on your plants. They will tell you if they are not happy. If you are using a liquid fertilizer, just mix it in a 5-gallon bucket and use the mix to fill the Water Reservoir. They will self-feed as they draw the mix into the media. Because you have not used garden soil, you will have few, if any weeds. Any that arrive on the wind or from birds will be easy to prick out from the loose, damp media. Planting can be very intensive in these containers. Close planting also decreases weeds – there is a saying that “where there is a plant there is not a weed”. After you have harvested a crop, just remove the spent plants, refresh the media with compost and fertilizer, and replant. Coir or peat based media will last for several plantings before it breaks down and needs replacement. Compost based media will continue decomposing, but it does not "break down" in a negative way. It can be used continually with replenishment and fertilization. How many plantings you get from the media will depend on several things including what type of plants you grow and the environmental conditions in your location. You will need to examine and assess the media between plantings no matter what you choose to use. Provide an anchor for the roots. Serve as a nutrient pantry. Media assists in the delivery of water, oxygen, and nutrients. It must retain moisture, but never become waterlogged. It needs sufficient pore space, but no large air pockets or voids. Media is one of your most important decisions, and is no less important in an SWC than it is in other containers or in the garden. There are several media recipes that can be used in SWCs. Which one you should use will depend on the plants you want to grow, the availability of supplies, and your own personal preferences. Bagged Potting Mix - Most SWC builders I have encountered use bagged, peat or coir based, soil-free potting mix. This is sufficient for many plants and is available everywhere. You must consider two things - it does not furnish any nutrients (even if it says so on the bag), and it has a tendency to break down over time. There is no reason you cannot use this simple media, but it is not my choice for edibles. Bagged Potting Mix Improved - Pore space and soil quality can be improved by making modifications to the Bagged Potting Mix. Start with 2-parts bagged, peat or coir based, soil-free potting mix. Add 2-parts Leaf Mold Compost and 1-part Expanded Shale (or Perlite). The Rose Soil Recipe - You can mix up a very nutritious media by using 2- to 3-parts Rose Soil and 1-part Leaf Mold Compost. This mix is a little heavier than peat or coir based mixes, but it is very friendly to good root development and healthy plants. Rose Soil has compost in it already, but adding more is beneficial, especially for edibles. You can tweak this by adding Expanded Shale or Perlite to increase pore space and lighten up the mix if desired. I am always experimenting with soils. As long as they meet the basic criteria, feel free to mix and tweak until you find your perfect blend. I prefer a compost based media because it is friendlier to the Soil Food Web – the zone of life in the root zone that is home to beneficial micro- and macro-organisms that aid in healthy plant development. 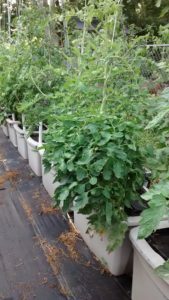 In my SWCs for tomatoes I use straight two-year old leaf mold compost from Nature's Way Resources to which I add perlite and vermiculite for aeration and water retention. I pay close attention to nutrition throughout the season. I use SROFs in my soil prep before planting and use nutritional drenches after periods of stress (heavy rains, hot & humid, long duration spring winds). Arbor Gate Organic Soil Complete - This is a perfectly balanced media right out of the bag. It requires no amendments or tweaking. It is a great media for SWCs. The SWC works using capillary action. We start with damp media and provide a water source that is in contact with the media through the Wicking Pot. As water is used by the plants or through evaporation, more will be drawn into the media for continual availability. Capillary action has some limitations. The Soil Chamber should be at least 8” deep to be suitable for most plants, but no more than 11” – 12” deep to insure adequate capillary action takes place. You will need to take some quick measurements when you start a project with a new container. For example, the tote we are using for our project is about 16” deep. We are going to plan for a Soil Chamber that is 11” deep. This means that the supports we will use to hold the Aeration Shelf should be about 5” tall and that our drainage holes should be at about 4” from the bottom if the reservoir to give us the 1” of air space we need. This gives us a pretty significant amount of stored water - approx. 3.3 gallons. A deeper container might mean using taller supports. Can I put a soil barrier on top of the Aeration Shelf? Yes, but…..The barrier MUST not block oxygen transfer. You can use a piece of fiberglass window screen, weedmat or burlap. Do not use plastic sheeting. I do not advise using anything at all unless it is an absolute necessity. Roots must breathe. I don’t use anything and I don’t have trouble with soil falling through the shelf. 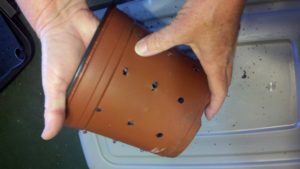 The holes we are using are smaller than the drainage holes on most planting containers. I cut my Aeration Shelf too small and there are gaps on the sides where soil can fall through. What do I do? If you cut your Aeration Shelf too small, use a strip of screen among the open edges, not all the way across the shelf. If you cover the top of the media in the Wicking Pot, it will not work. Some SWC sites recommend laying the fertilizer in a strip on the top of the soil. Should I do that?? I see those, too. I have tried it both ways and I see no advantage of creating a strip of fertilizer in the top of the media. This strip just gets in my way when I plant. Mixing an SROF into the top 2/3 of the media distributes it well and does not interfere with my planting plans. I see recommendations for using 2 or 3 cups of fertilizer at planting. Should I do that? I see no reason for this excess, especially if you are using a soil mix using compost and natural nutrients. I use 1.1/2 cups, divided into three portions that I mix into the soil as I fill the container as described above. This is sufficient for a normal season, even for heavy feeders. Your plants will generally signal their needs. If they are growing well, producing as expected, and having few disease or insect attacks, they are telling you they are happy. If any of these signs are negative, you should investigate. The answer might be as simple as a nutrient deficiency, which is usually easy to correct in an SWC. SWCs can be made from many containers – from soda bottles to half of a 55 gallon barrel. 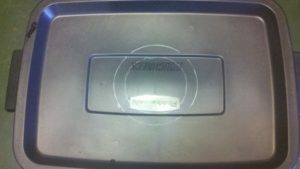 Plastic totes are often used because they are not offensive in appearance. 5-gallon buckets recycled from food service companies are also good candidates. The principles are the same for all containers, but adjustments need to be made for wicking. A modified one-gallon pot or a 5" pond basket is sufficient for an 18-gallon storage tote. In fact, I used the same setup in several 32-gallon totes and they work well. Can I paint my SWC? Yes! Plastic containers can be lightly sanded and painted with Fusion paint or Rustoleum 2X. These paints actually bond to the plastic as they cure. After the paint has cured, they can be left as is or decoratively painted. This is a great way to involve the kids, especially if your SWCs are part of a school gardening or science project. It's also a good way to disguise them from your HOA, if necessary. 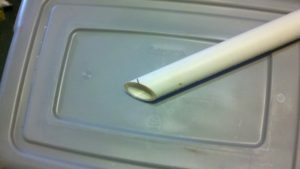 Mosquitoes can enter your SWC through the Fill Tube or the drain holes. Once inside they may breed in the reservoir. This is easily prevented. The drain holes can be covered with a small piece of fiberglass window screen attached with silicone caulk. The Fill Tube can be covered with an inverted can, a PVC cap or plug, or a piece of screen held on with a rubber band or cable tie. The screen does not interfere with filling if you decrease the flow of water a bit. Mix equal parts coarse Perlite and Vermiculite and moisten the mix. Fill the Wicking Pot with this 50-50 mix leaving a 1” to 1.1/2”headspace at the top. Fill the space with moist Vermiculite up to the rim and level off.